Skinner Cottage includes a 1-bedroom Carriage House and a 2-bedroom apartment (the third floor) of the historic (1802) Skinner House, home to Richard Skinner, the ninth Governor of Vermont. It has private entrances, off-street parking, and is very close to (just 2 doors from) the Equinox Hotel and Resort. Our Carriage House is the second floor of the historic Carriage House. It too has a private entrance, off-street parking and is very close to the Equinox Hotel and Resort. The 800 square foot 1-bedroom suite-apartment (and pull-out couch in the family room) has a lovely view of gardens and the Equinox Mountain. Our 1,200 square foot 2-bedroom suite-apartment (the 3rd floor of our Main House) has a view of lovely gardens and the Equinox Mountain, and historic Main Street. Skinner House and the Equinox Hotel & Resort are on picturesque historic Main Street, Vermont's most quintessential village street scene, lined with spectacular maple trees and beautiful historic houses. Guests can stroll along the 'million dollar marble walkway' of Manchester Main Street to shops, restaurants, and points of interests. Beautifully restored by retired educators who once owned a local historic (1779) inn, home to Ethan and Ira Allen, famous Green Mountain Boys. Skinner House continues to meet and serve our guests in a beautiful four season resort community. We have a passion for the Manchester area and community. Manchester caters to a diverse community ... from ski rentals to wedding parties at the Equinox Hotel & Resort ... from all-year outlet shoppers to golfers, attending our major Summer horse event, the car and floral shows, amazing blazing foliage season, the long slow cool Summer, vibrant Spring and great Winter skiing and good times around the fire ... Manchester is a full 4 Season Resort community. Skinner House is very well received by our guests. Many have returned to stay with us each year. We hope you enjoy it. Skinner Cottage is very well located on Manchester's most beautiful Main street, is a historic home, well situated next to the Equinox Hotel & Resort with its outstanding facilities including world class spa and restaurants, minutes from even more excellent restaurants, cafes, taverns and shopping, only minutes walk to two golf courses and tennis facilities and only a short drive to skiing. Being in Southern Vermont, Manchester and Skinner Cottage are well situated to explore a wide range of all-season and seasonal Vermont vacation activities. Even a walk up and down the million dollar marble sidewalks of Main Street - on which Skinner Cottage is primely located - we think you will agree, will take you to another time! Each rental apartment (the Carriage House and the 3rd floor Main House apartment-suite) has a full bathroom. Equinox Hotel and Resort, golf course, spa, tennis, walking & hiking trails, and restaurants within 100 yards and walking distance. As noted, all dishes, utensils, and bedroom and bathroom linens are provided (for 2 persons for the Carriage House rental, and for 4 persons for the 2-bedroom apartment rental in the Main House). A lovely, cozy Carriage House space for our Manchester Vermont adventures. 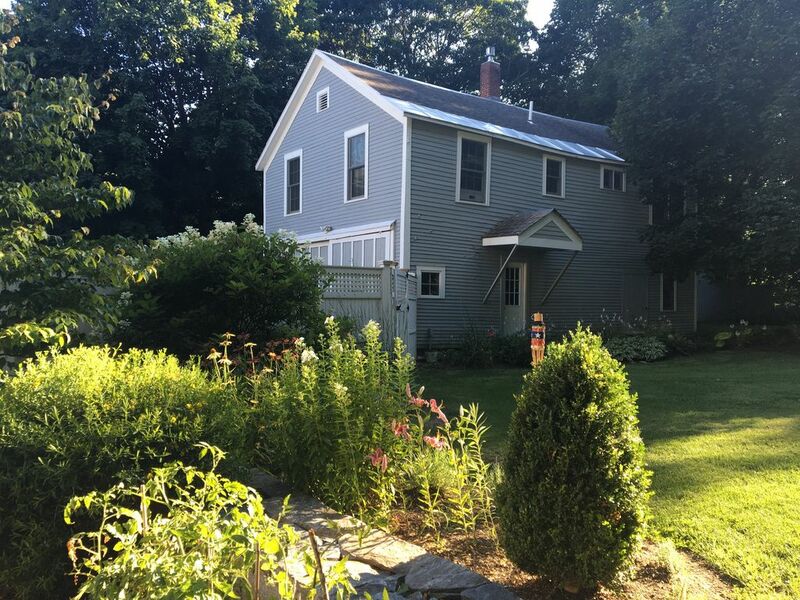 This lovely one bedroom Carriage House is our home away from home in Manchester. We especially love the cozy well-appointed kitchen and the fireplace in the living room. The landlords are caring and immediately responsive to all concerns. Great place for a quick stay. Nice property, conveniently located. Perfect for two people. Great and spacious Carriage house in georgeous location right next to Equinox. Walking distance to outlets. Perfect location and enjoyable stay. My wife and I stayed in the large two bedroom apartment on the top floor of this grand old home for two nights while attending a wedding at the Eqinox hotel nearby. The bedrooms are large and the beds very comfortable. The apartment was clean and well furnished. The location is very close tho the Equinox and a short walk to pubs and restaurants. Highly recommended. We had a great time staying in the Carriage House. Manchester has a number of nice restaurants and is very close to some fun summer activities. We took advantage of our proximity to Equinox for a nice drink. We also had a fun afternoon at Bromley Adventure Park.